Raila Odinga has for a third time in a row skipped NASA rallies which he was welcomed by kalonzo. Kalonzo is campaigning for late nyenze wife Edith nyenze to clinch the kitui west parliamentary seat which was left vacant after the death of her husband. Edith nyenze is expected to win the race since she is vying on a wiper ticket. 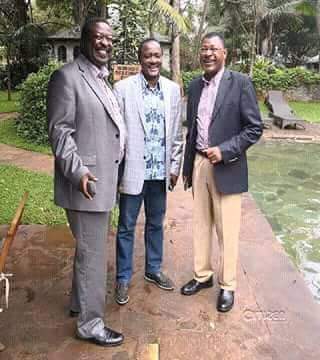 Raila Odinga skipped today meeting where he was to meet the NASA principals on the issue about wetangula who will be ousted as minority leader today by senate when they convene meeting. Odinga cited bad weather as reason for his not visiting the region but pundits have predicted that its worse than it meets the eye. Raila is said to be snubbing his fellow principals As he warms up on his deal with jubilee. Raila is expected to be given a good position where he will comment on jubilee affairs directly and be involved directly. He is currently receiving presidential treatment as the deal continues to manifest.